ASAP Mob (stylized as A$AP Mob) is an American hip hop collective formed in 2006, in Harlem, New York, by members ASAP Yams, ASAP Bari and ASAP Illz. The Mob is a collective of rappers, record producers, music video directors and fashion designers, who share similar interests in music, fashion, style and art. The collective mainly consists of New York-based rappers, most of whom carry the "ASAP" moniker, such as ASAP Rocky, ASAP Ferg, ASAP Twelvyy, ASAP Nast and ASAP Ant. The collective's resident record producer, ASAP Ty Beats, also carries the moniker and has produced several songs for his ASAP Mob cohorts, most notably Rocky's solo debut single "Peso." 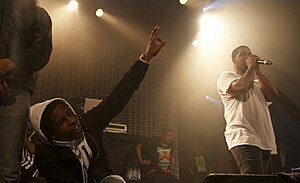 ASAP Rocky (left) and ASAP Ferg (right) performing with ASAP Mob, in December 2013. On August 28, 2012 the collective released their first full-length project together, a mixtape titled Lords Never Worry, which received mixed reviews by critics. In August 2013, ASAP Mob began working on their debut studio album, subsequently releasing their debut single, "Trillmatic", in December 2013. The song, performed by ASAP Nast, is an ode to '90s hip hop and features a guest verse from Method Man. Their debut album, titled Cozy Tapes Vol. 1: Friends, was a dedication to ASAP Yams, and was released in October 2016. In 2006, Steven Rodriguez, professionally known as A$AP Yams, formed the collective internationally known as A$AP Mob, with fellow New Yorkers, now known as A$AP Bari, A$AP Kham and A$AP Illz. Harlem rapper A$AP Rocky joined after Bari had kept bringing him up to Yams, who eventually took interest. In the summer of 2011, the group began to gain major recognition after the respective music videos for Rocky's singles "Peso" and "Purple Swag" (both produced by A$AP Ty Beats), went viral on YouTube. Rocky followed up with his breakout mixtape Live.Love.A$AP in October, which was praised by critics and fans alike. In October 2011, Rocky signed a record deal with Sony Music Entertainment worth $3 million. $1.7 million of that money was earmarked for his solo work and $1.3 million to fund his company A$AP Worldwide, along with A&R and executive producer ASAP Yams. Rocky said that he sought a "bigger platform" for him and his collective with the deal. In 2011, A$AP Dom, the collective's designer, who worked on the design of the iconic "VSVP" pieces for streetwear brand Black Scale, wanted to venture out and do his "own thing." He subsequently left the Mob and changed his moniker to Dominic Lord and is now a songwriter and producer. Members of ASAP Mob with Joey Badass (left) at the Under the Influence Tour in Toronto, Canada on 10 August 2013. On August 27, 2012, A$AP Mob released their debut project, a mixtape titled Lords Never Worry, as a free download. During September through November, Rocky promoted his solo debut album, with a 40-date national concert tour, the Long Live ASAP Tour, with opening acts Schoolboy Q, Danny Brown, and A$AP Mob. In January 2013, A$AP Ferg was the second member of the group to sign with a major label, also signing a joint venture deal with Rocky's same labels, RCA and Polo Grounds, which released his single "Work", for retail on iTunes. The labels also later promoted an official remix of "Work", featuring Rocky, French Montana, Schoolboy Q and Trinidad James. Rocky's debut album Long. Live. A$AP, was released on January 15, 2013, to generally positive reviews from critics. The album debuted at number one on the Billboard 200 chart, with first-week sales of 139,000 copies in the United States. A$AP Ferg announced that A$AP Mob would release their debut album after the release of his solo debut album Trap Lord. It was later revealed the release date for the upcoming ASAP Mob album would be October 15, 2013, however it would be delayed. A$AP Ferg released his respective debut studio album Trap Lord, on August 20, 2013, under A$AP Worldwide, Polo Grounds and RCA. The album peaked at number nine on the Billboard 200 and number four on the Top R&B/Hip-Hop Albums chart, with first-week sales of 32,000 copies in the United States. In November 2013, ASAP Rocky announced that ASAP Mob's debut album would be titled Lords. On December 3, 2013, it was announced that the album would be released on March 4, 2014. On December 4, 2013, the album's first single, titled "Trillmatic", was released along with an accompanying music video. The single, produced by A$AP Ty Beats, features verses from ASAP Nast and fellow American rapper and New York City-native, Wu-Tang Clan's Method Man. The album title was then changed to L.O.R.D. On January 13, 2014, "See Me" by ASAP Ant, another song from L.O.R.D. was released. On September 26, 2014, A$AP Yams revealed L.O.R.D., had been scrapped. Posting on his personal Tumblr and replying to a fan, Yams wrote the following: "L.O.R.D. IS SCRAPPED. FLACKO JODYE SEASON THIS FALL". On January 18, 2015, members of A$AP Mob revealed that A$AP Yams had died. The cause of death was ruled to be caused by acute mixed drug intoxication. On October 15, 2016, A$AP Rocky confirmed that the group's compilation album Cozy Tapes Vol. 1: Friends was completed. Cozy Tapes: Vol. 1 Friends was released on October 31, 2016. The A$AP Mob album featured several artists, including Playboi Carti, Skepta and Tyler, The Creator. The album consists of 12 songs with an overall time of 43 minutes. The album was dedicated to A$AP Yams. On August 1, 2017, A$AP Rocky announced that Cozy Tapes Vol. 2: Too Cozy would be released on August 25, preceded by ASAP Twelvyy's 12 album being released on August 4 and ASAP Ferg's Still Striving mixtape on August 18. On January 18, 2015, ASAP Mob founder Steven "ASAP Yams" Rodriguez was found dead at the age of 26. The cause of death was ruled an overdose due to mixed drug intoxication. However ASAP Mob members and affiliates claim Yams died due to his sleep apnea which caused asphyxiation and pulmonary aspiration. "Put That on My Set"
^ a b c Pablo, J. "Meet The A$AP Mob: Talking To Ant, Ferg, J. Scott, Nast, Twelvy, And Yams". Retrieved 18 December 2012. ^ Huynh, Davis. "A$AP Rocky – Always $trive and Prosper". Hypetrak. Archived from the original on 2013-10-16. Retrieved 2013-07-04. ^ "A$AP Mob's 'Trillmatic' Video: Count the 1990s References". Rolling Stone. Retrieved 19 January 2015. ^ a b "Video: A$AP Mob f/ A$AP Nast & Method Man – 'Trillmatic'". Rap-Up. Retrieved 19 January 2015. ^ "A$AP Nast Ft Method Man - Trillmatic - HipHopLeague". HipHopLeague. Retrieved 19 January 2015. ^ Coleman II, C. Vernon (October 14, 2011). "A$AP Rocky Signs Record Deal With Polo Grounds Music/RCA Records". Hip-Hop Wired. Retrieved June 3, 2012. ^ "The New Bidding War Target: Dominic Lord, "Pierce" (Video) #Exclusive". Missinfo.tv. Retrieved 19 January 2015. ^ Daniel Isenberg. "A$AP Ferg Signs Solo Deal with Polo Grounds Music/RCA Records". Complex. Retrieved 19 January 2015. ^ "A$AP Ferg Videos - Says "Work" Remix To Feature A$AP Rocky & Trinidad James". Hotnewhiphop.com. Retrieved 2013-07-04. ^ "A$AP Ferg Teases New A$AP Mob Album". XXL. Retrieved 19 January 2015. ^ "HITSDailyDouble: Upcoming Releases". Hitsdailydouble.com. Retrieved 19 January 2015. ^ "Trap Lord: Asap Ferg: Music". Amazon.com. Retrieved 2013-07-20. ^ "Powerhouse 2013 Was Crazy!". Xxlmag.com. Retrieved 19 January 2015. ^ a b Zoladz, Lindsay (December 5, 2013). "Video: A$AP Mob: "Trillmatic" [ft. A$AP Nast and Method Man]". Pitchfork Media. Retrieved January 17, 2014. ^ "A$AP Ant Plans A Robbery In "See Me" Video - XXL". XXL. Retrieved 19 January 2015. ^ "Rap Release Dates: Juicy J, Meek Mill, Murs & Curtiss King, Killa Sha". Hiphopdx.com. Retrieved 19 January 2015. ^ a b Breihan, Tom (January 14, 2014). "A$AP Ant – "See Me" Video". Stereogum. Spin Media. Retrieved January 17, 2014. ^ White, Caitlin (January 18, 2015). "ASAP Mob founder cozy ASAP Yams dead at 26". MTV News. Retrieved January 18, 2015. ^ a b CARAMANICA, JON. "Staff Writer". New York Times. New York Times. ^ "ASAP Rocky Says ASAP Mob's "Cozy Tape" Is "Finally Finished"". ^ "A$AP Mob's Cozy Tapes Vol. 2: Too Cozy Is Coming Out This Month". The Fader. 2017-08-01. ^ Ducker, Eric. A Rational Conversation with ASAP Yams. NPR. Retrieved January 31, 2015. ^ Matthew Trammell, "Also Known," The New Yorker, January 18, 2016. ^ Mstarz (24 March 2015). "ASAP Rocky Says ASAP Yams Suffocated On Vomit & Sleep Apnea Killed Him [VIDEO]". ^ "A$AP Mob – Chart History: Billboard 200". Billboard. Prometheus Global Media. Retrieved November 16, 2016. ^ "A$AP Mob – Chart History: R&B/Hip-Hop Albums". Billboard. Prometheus Global Media. Retrieved November 16, 2016. ^ "A$AP Mob – Chart History: Rap Albums". Billboard. Prometheus Global Media. Retrieved November 16, 2016. ^ "australian-charts.com – Discography A$AP Mob". Hung Medien. Retrieved September 2, 2017. ^ "A$AP Mob – Chart History: Canadian Albums". Billboard. Prometheus Global Media. Retrieved November 16, 2016. ^ "ASAP MOB – Full Chart History". Official Charts. Retrieved September 2, 2017. ^ Lyle, Ashley (October 31, 2016). "A$AP Mob Releases 'Cozy Tapes, Vol. 1' Project". Billboard. Retrieved November 1, 2016. ^ "Chart Search for A$AP Mob (Bubbling Under Hot 100 Singles)". Billboard. Retrieved September 6, 2017. ^ "Chart Search for A$AP Mob (Bubbling Under R&B/Hip-Hop Singles) | Billboard". Billboard. Retrieved September 6, 2017. ^ "A$AP Mob Album & Song Chart History: Canadian Hot 100". Billboard. Retrieved June 6, 2017. ^ "NZ Heatseekers Singles Chart". Recorded Music NZ. June 5, 2017. Retrieved June 6, 2017. ^ Breihan, Tom (August 28, 2012). "Download A$AP Mob Lord$ Never Worry Mixtape". Stereogum. Spin Media. Retrieved March 17, 2014. ^ "iTunes - Music - Xscape (feat. A$AP Twelvyy) - Single by A$AP Mob". Itunes.apple.com. Retrieved 2014-04-24. ^ "Wrong (feat. A$AP Rocky & A$AP Ferg) by A$AP Mob". 28 April 2017. ^ "New Video: A$AP Nast Feat. Method Man 'Trillmatic'". Vibe.com. Retrieved 19 January 2015. ^ "Watch ASAP Rocky's 'Money Man' Film Featuring New Music From ASAP Mob". XXL. October 21, 2016. Retrieved October 22, 2016.